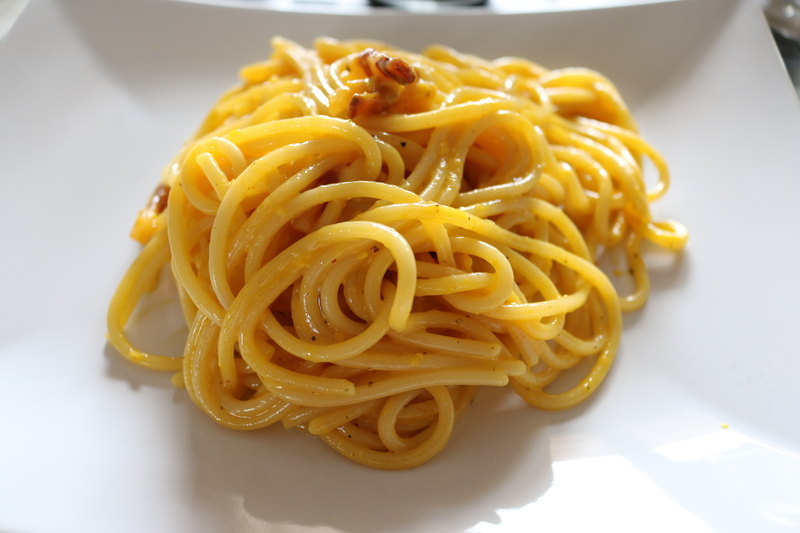 Spaghetti alla carbonara is a common quick dish in Italy and has many variations all over the country. The real recipe is strict though, and requires few, high quality ingredients: pecorino romano cheese and Guanciale. Guanciale is a cruded salami made out the pork jowl, rubbed with salt and spieces, then cured for 3 weeks until it loses one third of its weight. Its flavor is stronger, and not smoked. If you can’t find pork jowl you can use sliced, not smoked beacon. Also, the real carbonara requires pecorino cheese. It *could* be replaced with parmesan if you can’t really find it in the stores, although many italians from central italy would be disgusted by your choice and wouldn’t call that a real Carbonara. Any other ingredient would be excessive, adding unnecessary flavor to the dish, which should be all about the egg and the Guanciale. 2 Eggs medium size (one egg for person). Fresh Grated Pecorino Romano cheese or Parmesan. 1 Cup of even sliced Guanciale or Beacon (not smoked) (in metric system around 40-50 gr per person). Put the cold water of the pasta to boil, and let the spoon of lard to melt in a frying pan at low temperature. Meanwhile, break the raw eggs in a glass bowl, add pecorino and pepper and stir firmly (1). My personal touch (2): place the bowl over the pot with the water, and let it warm at bain-marie. Remember it has to warm up, and the grated pecorino must melt without cooking the eggs to create a creamy, raw egg sauce. Stir everything with a fork from time to time. In the real recipe the egg is just broken in the pasta before serving, and the heat of pasta will cook it enough. The lard should be melt by the time, rise the heat a little and place the sliced guanciale in the frying pan, making sure all slices are separated from each other (3). Keep stirring them AND the egg sauce during the cook. The guanciale should first become transparent (4), then start to fry and become brown (5). Timing is important when it start frying, it has to be a little crunchy but must NOT burn. It will probably require a little practice at first, but having slices all of the same thickness helps a lot. Once it’s cooked take it off the lard, place a spoon of guanciale in the egg sauce (6) (if you want to add more taste, place a little spoon of lard from the frying pan to the bowl). Let all the flavors to mix then take the bowl off the heat. Water should be boiling by now, so it’s time to add salt and spaghetti to it. While the spaghetti are cooking, keep mixing the egg sauce and add a little more pecorino, which sould melt and make it more creamy (7). Let it cool down and check the consistence. I like it to be creamy enough to glue to the spaghetti. When spaghetti are ready, remove them from the pot and drain them from the water completely (8). Too much water would waste your efforts for the creamy sauce. Then place them to the bowl and start mixing them, adding pecorino (9) again and the rest of the guanciale (10). Place them in the dishes (better if warmed) and serve hot. Place pecorino and pepper on the table to allow your guests to add more if they want to! 1. Stir the eggs with pecorino and pepper. 2. Put everything to warm up at bain-marie. 3. Place guanciale and separate each slice. 4. It will get transparent soon. 5. And few minutes later crunchy. 6. You can also add a spoon of lard in the sauce, once it’s cooled down, to add more taste to the sauce. 7. The sauce should be dense enough to ‘glue’ to the pasta. 10. And then add guanciale.